Waiting at the barber while my kids got their haircuts, I was skimming through the old magazines they had around. One of the Korean magazines had a few beautiful pictures of dry persimmons, and this orange roll with nuts in the middle. Of course, all instructions were in Korean. I asked the ladies who work there what it was, and after a few minutes of going back and forth, another nice customer stepped in to help translate for us. He found out from the women where to buy the ingredients and how to make this roll. Hope he got a great haircut for his good deed :)). Gotgamssam is a traditional Korean desert or snack that is served with cinnamon or green tea, and it requires only 2 ingredients. I was told that it is common in Korean homes to have a few rolls tucked away in the refrigerator for company. Super easy to make, I was reminded of diabetic family members who stay away from dessert. A few slices of this might be a welcome treat for them. Give it a try. 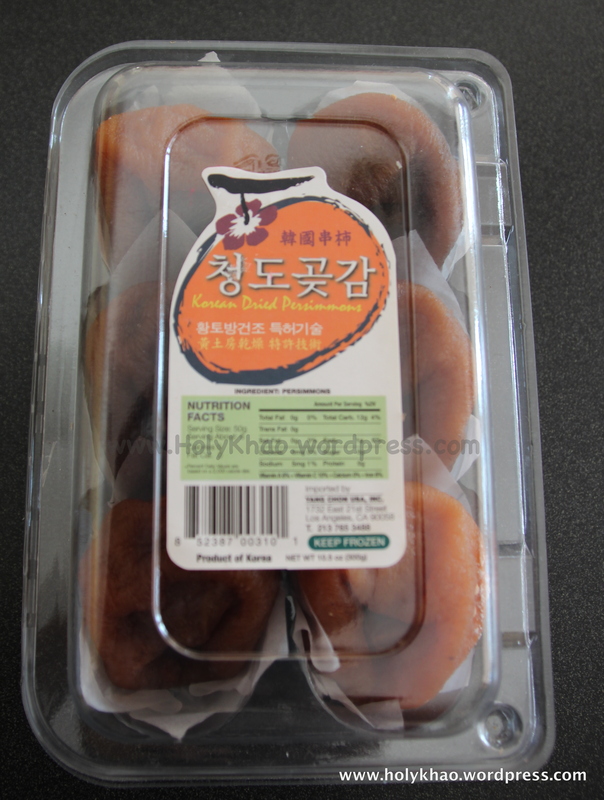 You can buy dried persimmons in the frozen section of your International market. The box pictured here was around $6. 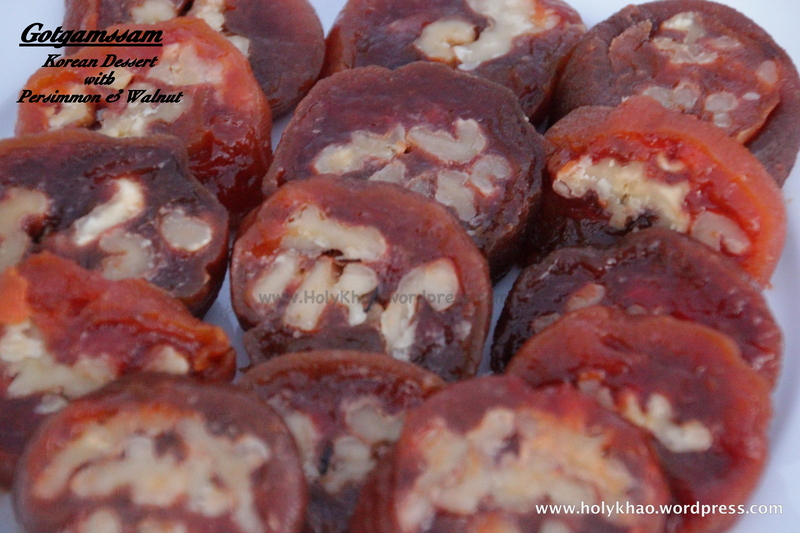 If you cannot find dried persimmons, this same technique can be used for dried apricots which are more easily available. 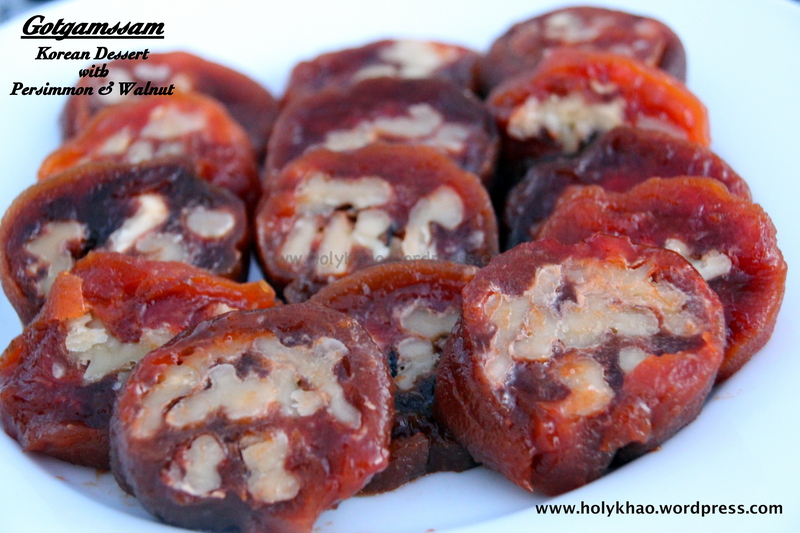 Looking online, I learnt that the apricot version is called Salgussam. 1) Preheat oven to 350*F, pour the walnuts on a rimmed cookie tray, and place on the center oven rack. 2) Bake for 6-8 minutes, stirring once in between, till golden and fragrant. 3) Remove from the cookie tray onto a plate and spread to cool completely. 4) With a sharp knife, trim the ends of the persimmon, and slit all the way down only on one side to form a flat, rectangular piece. 5) Lay a large piece of plastic wrap on the counter, and line up the persimmon slices where the edges slightly overlap. 6) Place a double or triple layer of the toasted walnuts on top of the persimmon slices and gently press into the fruit to hold in place. 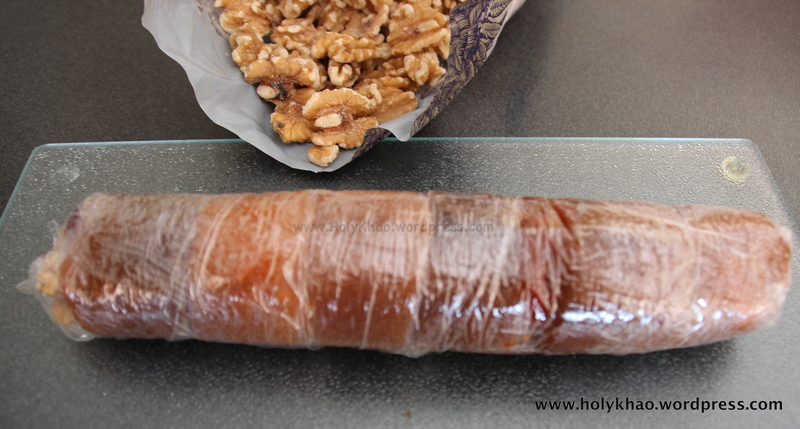 7) Gently, but tightly roll up the fruit over the walnuts and roll into a log. Cover with plastic wrap and reshape into a circular log if necessary. 8) Place the log in the freezer for about 30-45 minutes to firm up. 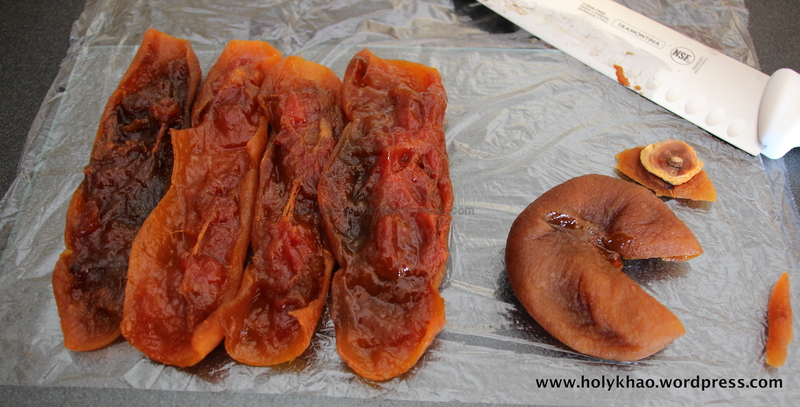 9) Unwrap, and cut each persimmon into 3 slices using a serrated knife. 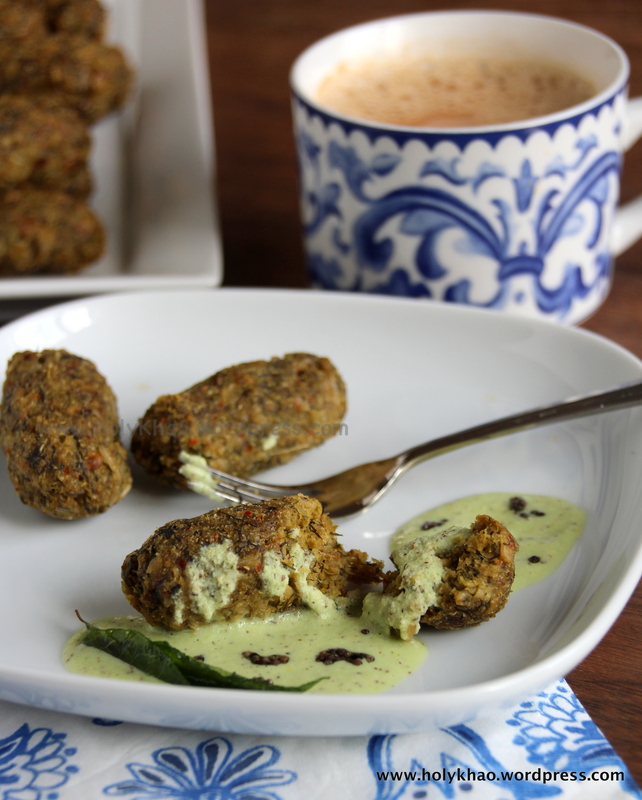 10) Serve with green tea or cinnamon tea. 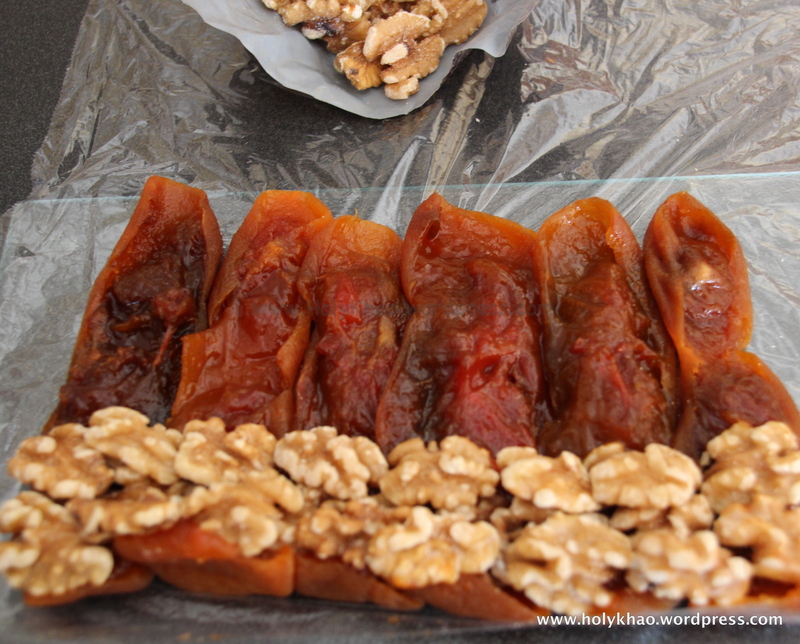 If the slit fruit seems too ‘pulpy’, gently scrape out some of the soft stuff before filling with the walnuts. Toasting the walnuts was my idea – you may skip this step if you like. Consider substituting candied walnuts for a different taste. Original Chipotle Tofu Sofritas is braised (seared on high heat in fat, then simmered in a liquid) in a combination of spicy peppers and spices. While I would have loved to replicate the exact recipe, I didn’t want to buy 1-use ingredients like poblano, adobo, etc. This version here is quite close in taste, but easier and not as saucy as the original. You can use store bought taco seasoning or make your own blend with ingredients at home. 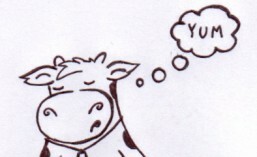 1) Drain tofu from package and press to remove as much moisture as possible. 2) Move to a bowl and crumble the tofu with your hands or a fork. 3) Mix in the taco seasoning, red chilli powder, cumin and oregano. 4) Heat a wide & thick-bottom pan, and add oil. 5) Add the minced garlic and saute till golden. Do not burn it. 6) Add the chopped onions and saute on medium-high till it starts to brown lightly. 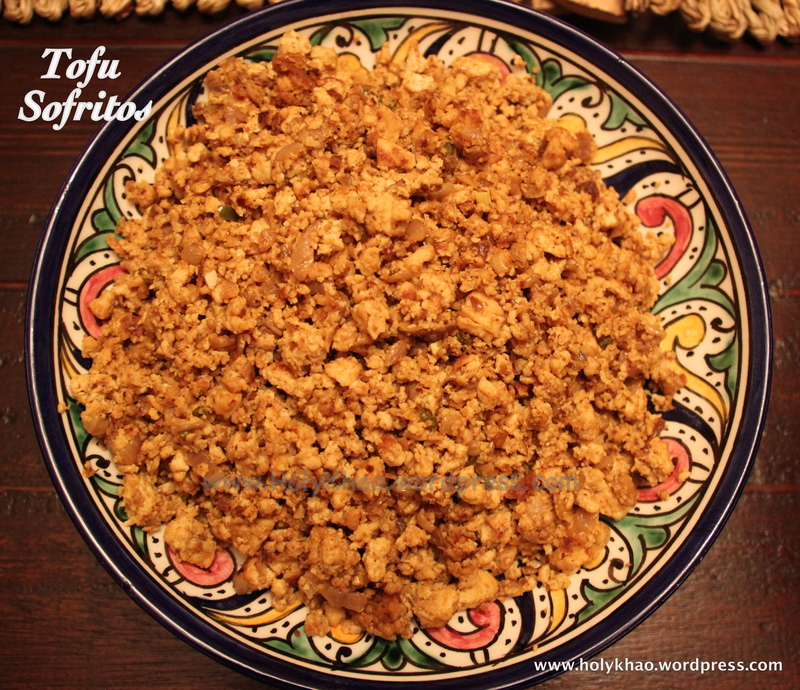 7) Now add the seasoned tofu and stir fry on medium-high for 3-4 minutes, stirring often. Add another teaspoon or two of oil if the tofu mix sticks to the bottom of the pan. 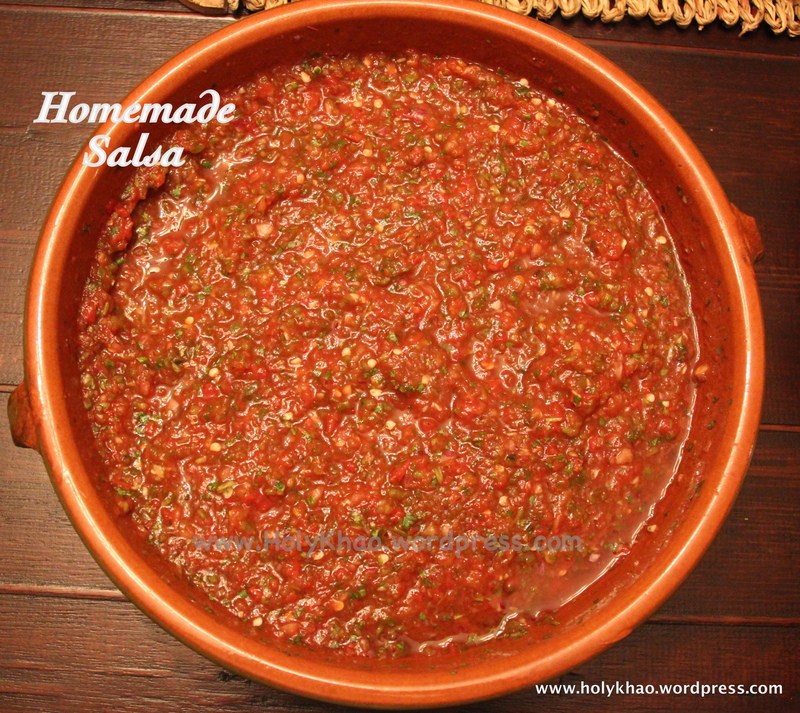 8) Add in the salsa or tomato paste mixture and mix well. Continue stir frying till well incorporated and the mixture is almost dry. Adjust salt to taste. Top with chopped cilantro if you like. 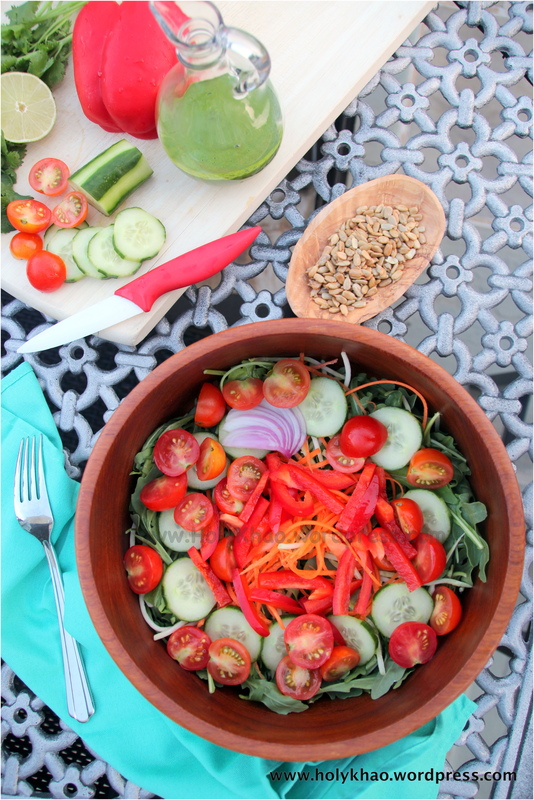 This can be served on a salad, in a burrito, as a lettuce wrap, or with rice or quinoa. 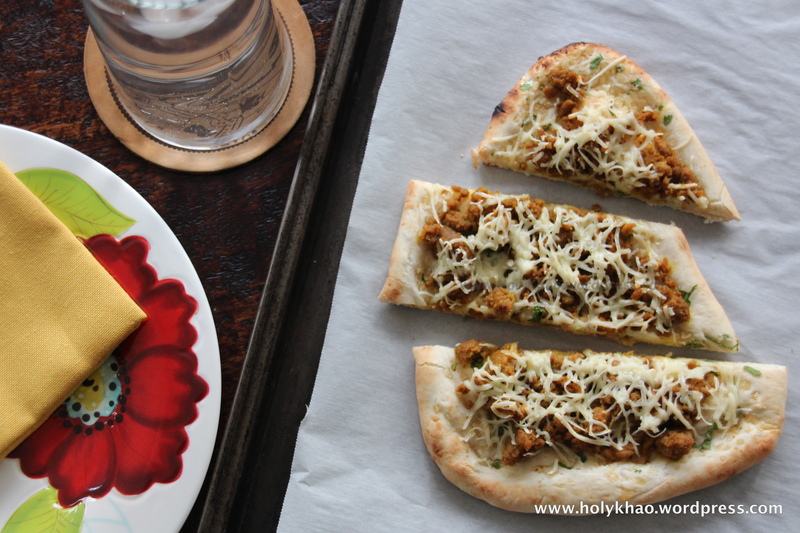 As promised – here is the next easy appetizer idea. 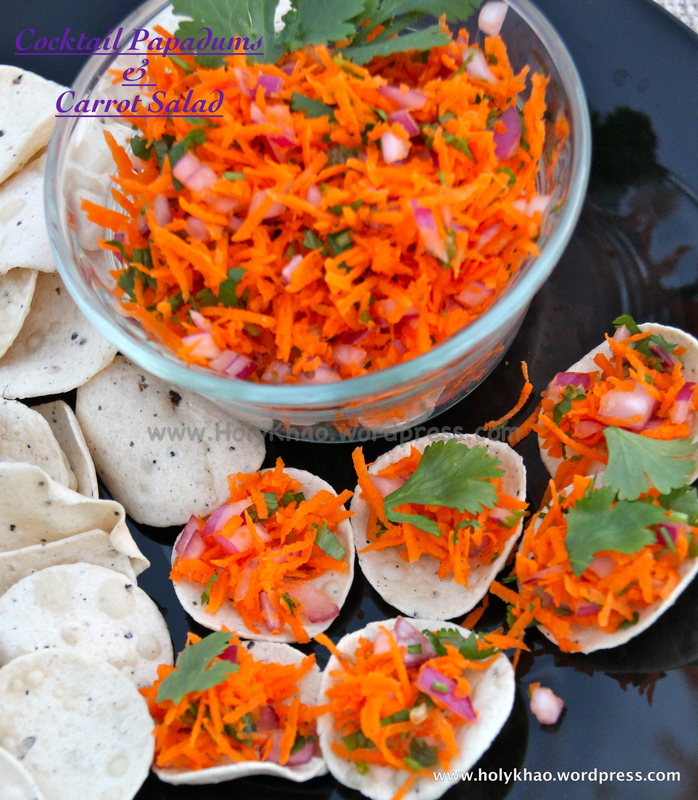 Most Indians will be familiar with some version of this carrot salad. 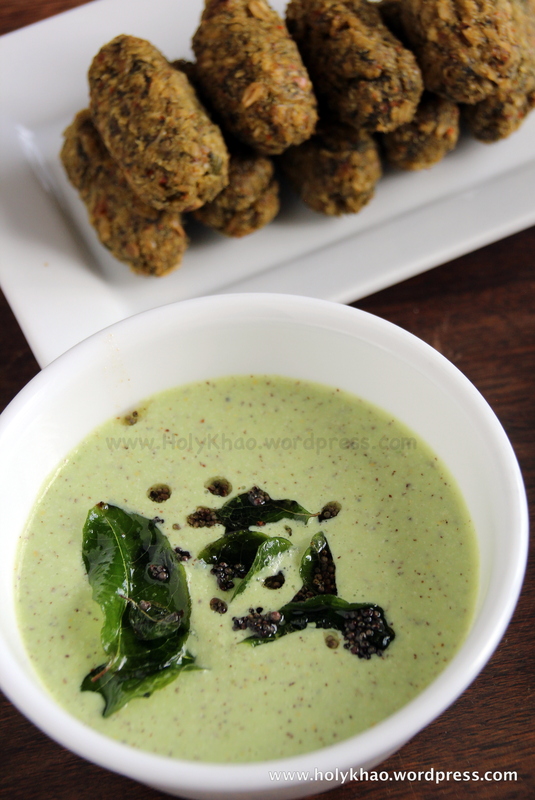 You can add in seeded & finely chopped tomatoes, or sprouted mung beans. I have just added a small twist to how it’s served. 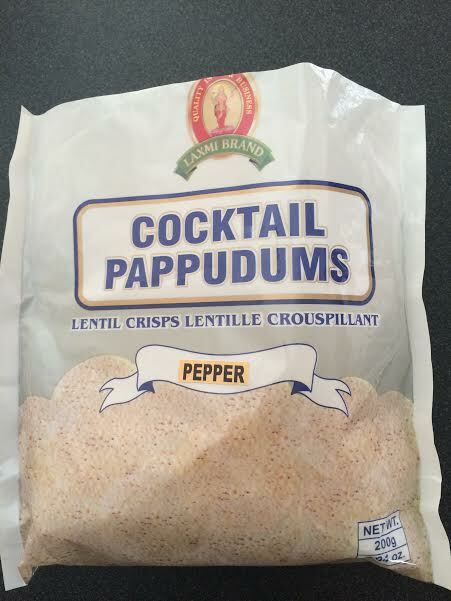 Cocktail Papadums (mini papads) are available at most Indian grocery stores. If not, you can use tortilla chips / scoops. 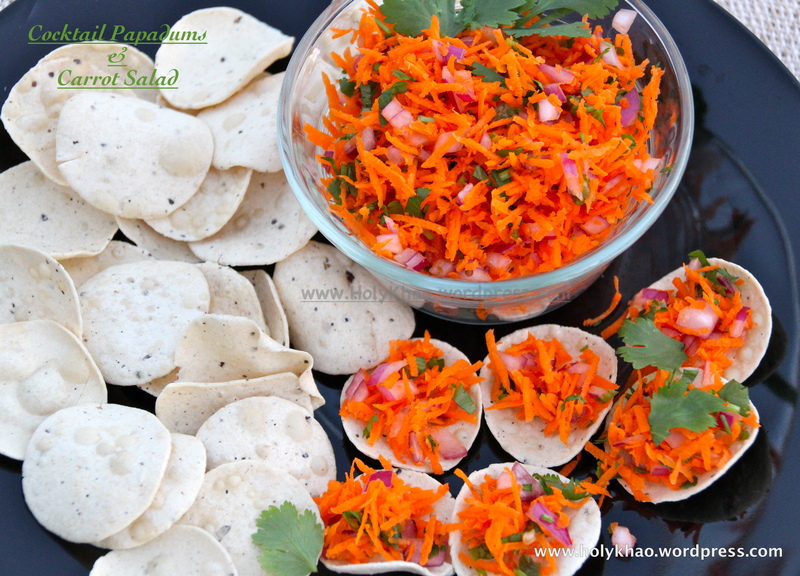 These papads and the salad can be made ahead of time and assembled just before serving. Hope this helps make your entertaining easier :)). 2) In a bowl, mix together the grated carrots, onion, green chillies and mung beans (if using). Refrigerate till ready to serve. 4) Serve in a bowl on a plate with the papads. Guests can fix their own bite size snack. Growing up, this was something we occasionally had as Sunday breakfast to give my mom a break from cooking. We slathered our bread with ghee and toasted it on the griddle till it was golden and crunchy, and topped it with this spicy carrot salad. I still enjoy this salad, but without the bread! Is everybody getting ready for the holiday madness? For many years, I felt like I was short changing my kids and family if our holidays didn’t involve hand made stuff, decorating, cleaning and cooking like a maniac, and entertaining over the 6+ weeks starting mid-November. It’s so easy to get caught up in the picture perfect version of the holidays that is sold to us by retailers and media, that we forget it took a large paid team of people to come up with what we see in ads. 2 years ago, I decided that I would not do anything that my kids didn’t really care about. Surprisingly, they were fine with not putting up a tree (second time in 15 years; the first was when we lived overseas for a year)!! That December, we travelled to Jamaica for a gloriously relaxing vacation, took naps, read books, watched movies and played Scrabble. Not a single wreath/christmas decoration came out of the box. We did do some casual entertaining (as in easy meals, or order in Chinese or pizza) with small groups, and were actually able to sit down and enjoy company. It was an eye-opener for me. I wasn’t a yelling nagging lunatic with a whisk in one hand and a dusting rag in the other!! (Atleast, I think I wasn’t one. My family may differ 🙂 but they have to agree that I toned it down a couple notches.) We did put up our tree last year, and baked, entertained, shopped, etc. but I didn’t stress about how perfect everything had to be. It’s definitely a work in progress, but I’m trying to walk down the same path again this year. What I want to say here is that while we may not be able to completely give up everything, the holidays are about appreciating our loved ones and making the time to connect with them. If you can effortlessly whip up a 7 course meal and still smile, hats off to you. But most of us need a stash of easy and quick tricks in our bag to tide the next few weeks. In the coming days, my plan is to post recipes of what I am making in my own home. I assure you that they will be easy, healthy (somewhat :)), elegant, and mostly make-ahead. After all, the hosts need to enjoy the party too. 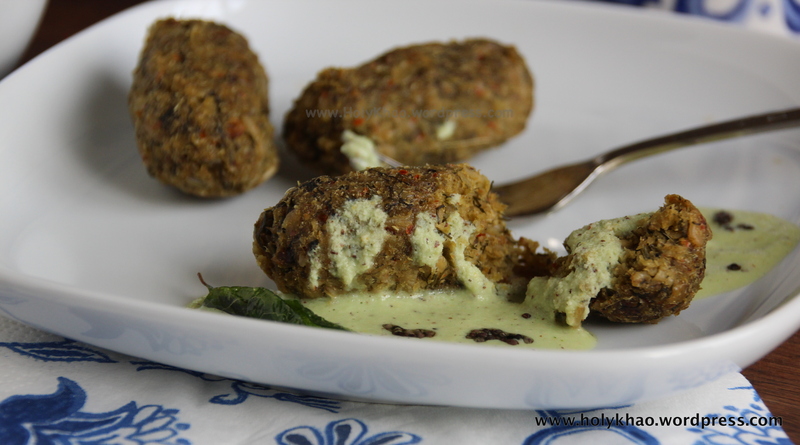 The recipe below is just a guide for making these cutlets. Since zucchini has a neutral taste, you can add any seasoning of choice: green chillies & chopped mint; sriracha & fish sauce; chopped dill & feta cheese; etc. I have used basil & oregano as I wanted to empty them out. It is crucial to squeeze out the water from the zucchini, and to add a binding agent to hold the mix together. (I might try adding mashed black beans instead of the potato next time.) The flour & starch / bread crumbs aid in absorbing any left over moisture, and may not be necessary if you have had enough time to drain the vegetable. I have made these cutlets a day or two before my party and heated in a toaster oven, and they tasted just as good as fresh. If you plan on reheating, place them on a rack after cooking so they cool without sitting in steam. Cool completely and store in a paper towel lined air tight box in the refrigerator. I sometimes make these and serve as after-school snacks and my 10-year old will eat 4-5 without complaint. 1) Set a colander in a plate or bowl,and grate zucchini into it using the fine side of the grater. 2) Toss with 1 tsp salt and set aside for 15 minutes. This will make the vegetable release a lot of moisture and drain into the lining plate/bowl. 3) Meanwhile, in another large bowl, mix the corn, garlic, chili flakes, basil, oregano & potato. 4) After 15 minutes, squeeze out the grated zucchini and add to the corn mixture. Adjust salt and spices, and chill for another 15 minutes (optional – this will help to set the mixture and make for easier shaping. Also, this will release any additional water in the zucchini, and you can control the amount of bread crumbs added). 5) Alternately, you may skip the chilling, and add the bread crumbs (or all-purpose flour & cornstarch) and mix well. 6) Heat a griddle on medium and add 2 Tbsp oil to it. 7) Shape 2-3 Tbsp of the mixture into balls and flatten into patties. Cook the patties on medium-high for about 3 minutes per side until golden brown. 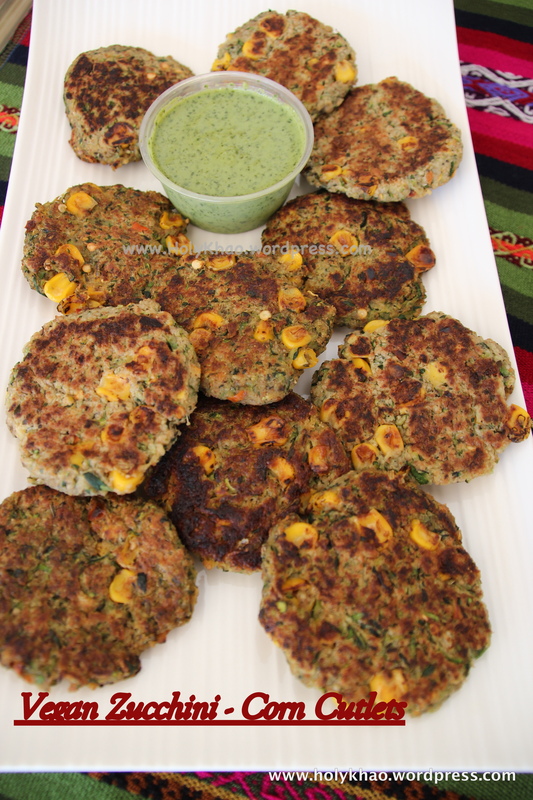 8) Serve with dipping sauce of your choice – ketchup, ranch, sriracha, cilantro-mint-green chili chutney, etc. *** Vegans might want to try flax egg as a binding agent. Please let me know how it turns out if you do.